Thanks for your sharing, would you please share a WLST script to create an OSB12c domain only? it is almost the same, you still need to run RCU and remove the BAM, BPM,ESS and SOA Stuff. I think RCU is for SOA suit, is it necessary for OSB? As I follow the linked code, I get an error when excuting "updateDomain"
for "oracle.security.opss.tools.lifecycle.LifecycleException: JDBC password for opss-data-source is missing for configuring security store to database." Error: updateDomain() failed. Do dumpStack() to see details. File "C:\btm\dev\EMaaS\emcapms\scripts\wlst\createOSBDomain2.py", line 167, in ? Reason: oracle.security.opss.tools.lifecycle.LifecycleException: JDBC password for opss-data-source is missing for configuring security store to database. oracle.security.opss.tools.lifecycle.LifecycleException: JDBC password for opss-data-source is missing for configuring security store to database. com.oracle.cie.domain.script.jython.WLSTException: com.oracle.cie.domain.script.jython.WLSTException: com.oracle.cie.domain.script.ScriptException: Domain Extension Application Failed! Do you have any idea? Thank you! Can you please let me know how you resolved the issue. I am facing the same issue. Nice blog and nice sessions at OOW14 on continuous integration! I have a couple of questions about your wlst script. "WSM-CACHE-SVR" , "WSMPM-MAN-SVR" , "JRF-MAN-SVR"
Somehow the OUI also changes these datasources to XA but when I do it with WLST they don't have XA enabled. Ok, the OUI changed these datasources to XA, but I was wondering - when will the repository database connection be part of an distribute...! Do you know what determines whether UDDs are created inside JMS modules instead of non-UDDs? When I configured a domain using OUI, it created UDDs in the JMS modules, but only single destinations (queues/topics vs uniform distributed queues/topics) were created when domain was created using scripts. Ok, some more trial and error later, I've discovered that if you create an empty cluster, then no UDDs are created. But if you create a cluster and add the SOA/BPM/BAM/etc managed server to the cluster, the JMS destinations are converted to UDDs. So in 12c, it seems like they have added a little more intelligence into the templates compared to 11g. Can the following server groups assigned to managed server during domain creation? If not how can I assigned it to manages server? Can you please tell me is rcu utility need to run every time if you re create the same domain again? can we use the same schema to run domain creation script every time? what is the significance of getDatabaseDefaults() method? in script? Is there anyway to get the datasources created like when you are using the GUI to check the box that says uses RCU Data and it created the datasources for you in the domain? I am getting the opss-data-source is missing error as well when trying to extend with OSB. I need use java weblogic.WLS but when I am trying updateDomain I get this error .. anybody have some idea? If I tried execute script with wlst.sh everything works ok. File "/var/fmw/domain/osb.py", line 264, in ? Reason: oracle.security.opss.tools.lifecycle.LifecycleException: Fail to find default JPS Context in /var/fmw/domain/osb_domain/config/fmwconfig/jps-config-jse.xml. oracle.security.opss.tools.lifecycle.LifecycleException: Fail to find default JPS Context in /var/fmw/domain/osb_domain/config/fmwconfig/jps-config-jse.xml. Were you able solve this issue? I'm trying to figure out how to create a simple development domain (SOA+OSB) with Docker...did you make that thing? I tried to use the above script to create the clustered Weblogic domain and I was getting the below error when I was trying to start the weblogic server, could you please let me know how to resolve the below issue? 1. weblogic.management.provider.internal.RuntimeAccessImpl$ParseException: [Management:141266]Parsing failure in config.xml: weblogic.management.ManagementRuntimeException: Could not create the JMS descriptor. 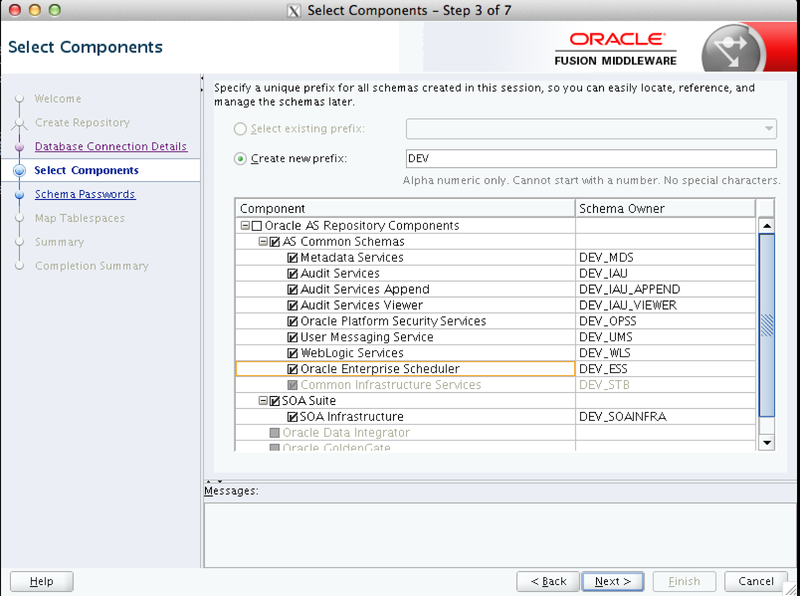 Error encountered in file: /home/oracle/wls_domains/domains/soa_qa_domain/config/jms/bampersistencejmsmodule-jms.xml. Caused By: weblogic.management.provider.internal.RuntimeAccessImpl$ParseException: [Management:141266]Parsing failure in config.xml: weblogic.management.ManagementRuntimeException: Could not create the JMS descriptor. 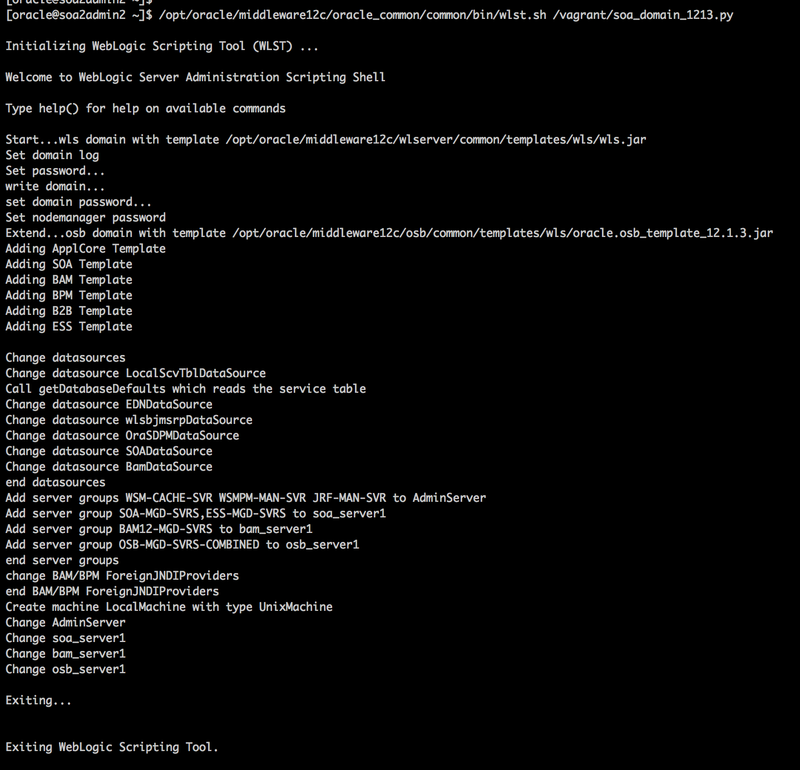 Error encountered in file: /home/oracle/wls_domains/domains/soa_qa_domain/config/jms/bampersistencejmsmodule-jms.xml. STDOUT: WARNING: This is a deprecated script. Please invoke the wlst.sh script under oracle_common/common/bin. Error: runCmd() failed. Do dumpStack() to see details. Reason: java.lang.IllegalArgumentException: WSM-04602 : A password is required to connect to a database-based MDS repository. java.lang.IllegalArgumentException: WSM-04602 : A password is required to connect to a database-based MDS repository. Why don't use this scripts in production? It's self-documented, everything in one place, easy to use and perfect when restoring from crash.